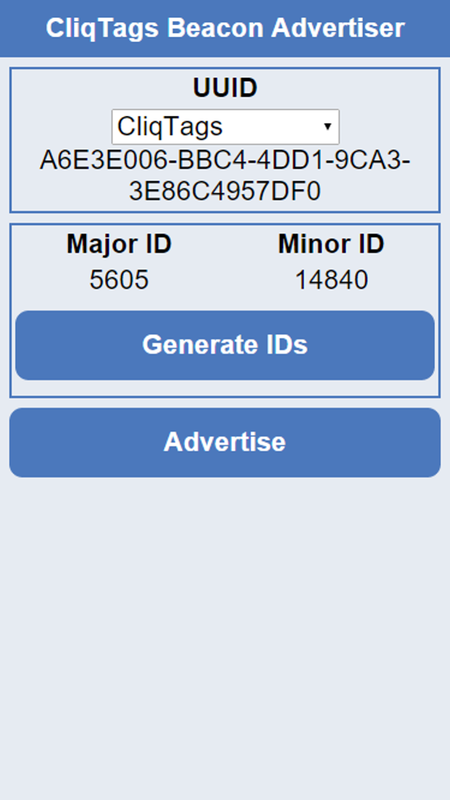 A simple iBeacon-compatible advertiser that can be used in place of a hardware beacon when evaluating beacon scenarios. Possibly select a UUID other than the default. 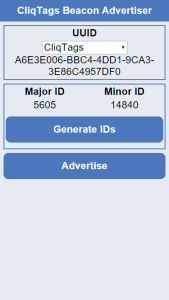 Click “Generate IDs” to generate Major ID and Minor ID. Tap “Advertise” to start advertising. Tap again to stop. Ensure that you have Bluetooth activated on your device. Please note that the app needs to be in focus (visible) for it to advertise. Changed IDs take effect when advertising is started. Chosen IDs are saved persistently. This app doesn’t replace hardware beacons in live installations. Older Android phones and versions didn’t support BLE advertising, even when they supported BLE as such. The app is also available for evaluation on iOS (iPhone 4 or newer).